The virtual battlefield is no trifle! Here only the strongest, smartest and those who learn fast will survive. Fury was created in order to provide gamers with the tools necessary to survive on the virtual battlefield. Thanks to properly designed peripherals, the gamer will become faster, more precise, more hardy and, most importantly, lethally efficient. Each of our solutions, starting with the mousepad, through mice, keyboards and ending with headsets, has been created to make their user a true warrior-gamer, with a full range of functions essential to improving in virtual gameplay at their disposal. The names of our products reflect their character and refer directly to the types of warriors that can be encountered on the modern battlefield, as well as legendary types of weapons, which have granted their bearers more than one historic victory. At Fury we want to provide every gamer with a range of essential functions which characterize hardware for gamers at a reasonable price, so that everyone is able to test their strength in virtual competition. Thanks to the mid-gameplay DPI adjustment function the gamer gains the ability to adapt their motions to the pace of the game. Sometimes the situation calls for a quick reaction, and sometimes careful aim before an important shot. This is why every Fury mouse features this function. A gaming mouse may feature one of two types of sensors – optical or laser. Fury relies on “optics, as they work much better with every type of mousepad and guarantee more precision during gameplay. Gaming gear is often distinguished by its ergonomics, mice as well as keyboards need to be profiled in a way which makes the gamer feel comfortable and free during gameplay, and these are the solutions which we incorporate in our products. A seasoned gamer is one who clicks a lot. Buttons, primarily on the mouse, as well as certain keyboard keys, need to be designed to withstand hundreds of thousands of quick clicks. 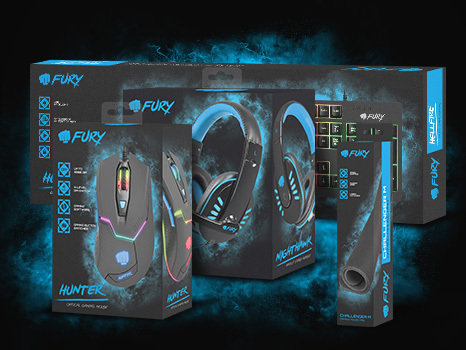 In products by Fury gamers will find durable mouse buttons (from 5 to 10 million clicks), as well as solutions increasing the durability of keyboard keys (UV Coating). Every gamer has their own preferences, which is why a valuable function of every mouse is advanced software. With it, each gamer can assign specific functions to buttons and edit profiles and macros for their favorite games. Backlighting is what gives gaming products their unique character. It helps gamers maintain efficiency in gameplay regardless of the time of day and, in case of the mouse, recognize the DPI level currently set. During gameplay it is worth having easy access to multimedia functions. Our gaming keyboards come equipped with special function keys, which facilitate multimedia access. Every gamer should have the unhindered ability to press several keys at once without fear of causing keyboard lock up or lag. This is why Fury keyboards are equipped with an anti-ghosting function for the key areas most important from a gameplay perspective. Nothing is as irritating, as accidentally pressing the Windows key (next to CTRL), which causes an exit to the desktop and often results in losing the game. Thanks to the Windows key block function in gaming keyboards, this problem ceases to exist. Often the Achilles heel of peripherals turns out to be a weak and tangling cable. Fury products use a nylon braided cable, which makes it durable and prevents it from tangling as easily as standard cables.